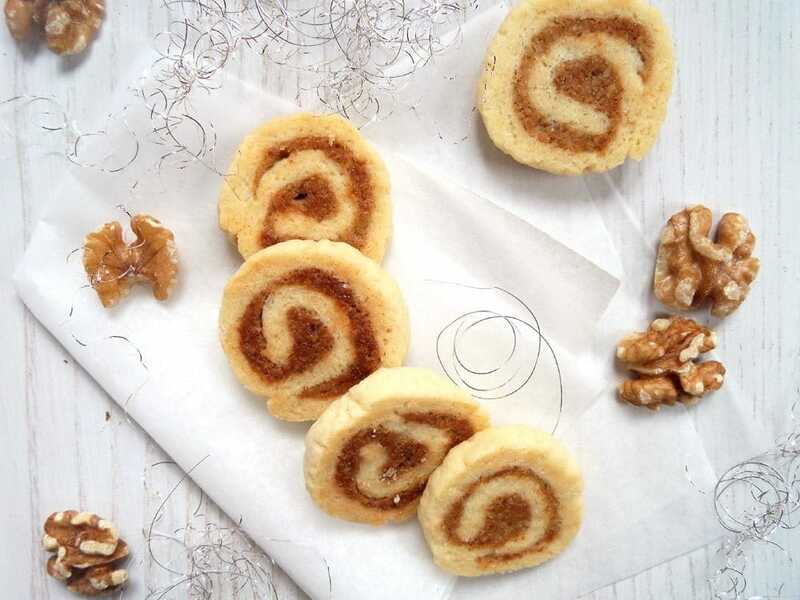 These Austrian Vanillekipferl are a must in our house every December. 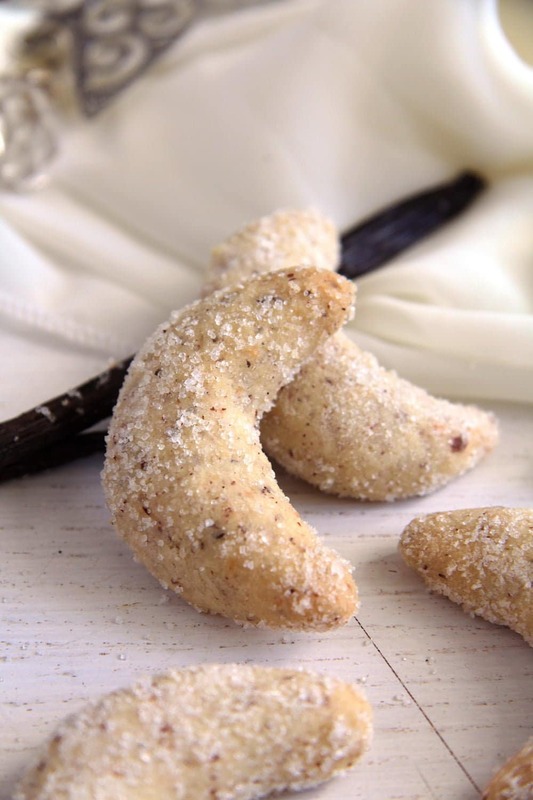 Tender and crumbly vanilla crescents, full of hazelnuts and rolled in vanilla sugar. Oma Lene’s famous Vanillekipferl, that she would make every December as long as she still lived in this house. She stopped making them 9 years ago when she had to move to a house for old people, but I kept making them ever since. I used to bring her some every year and she would be so happy about it. She didn’t get to taste them again this year. This post is in her memory, she died last Saturday, aged 96. We will all miss her. 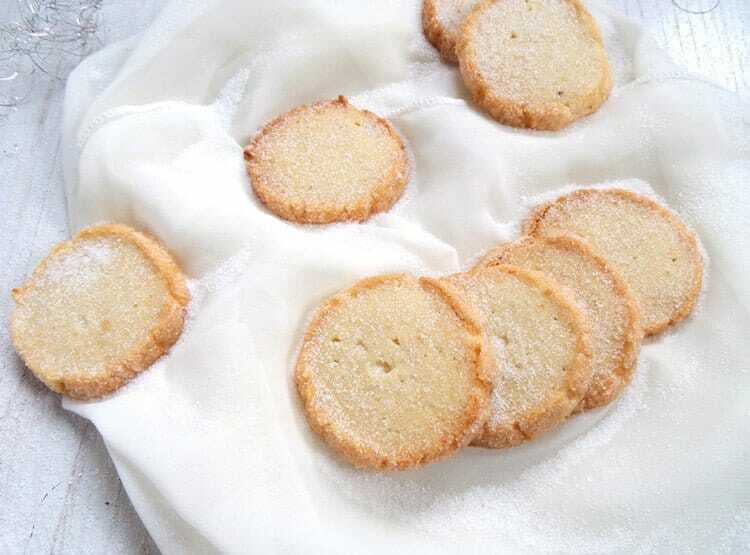 Use real vanilla sugar for dusting, it really makes a difference. I make my own with the empty vanilla beans. I keep those scratched out beans, ground them in the food processor (with some granulated sugar if the amount is too small for the food processor) and mix them with more granulated sugar. It keeps for a long time in a jar. Place the flour, sugar, cubed butter and hazelnuts in the food processor. Process shortly to form a crumbly dough. Transfer the dough to the working surface and knead briefly to bring it into shape. Form a disc, wrap it tightly in plastic foil and place it in the fridge for at least one hour. Preheat the oven to 175 degrees Celsius/ 350 degrees Fahrenheit. Line one or two baking trays with baking paper, you will have to work in batches. Form a long roll and cut it into small pieces. To check, form one ball, it should be roughly the size of a larger cherry. 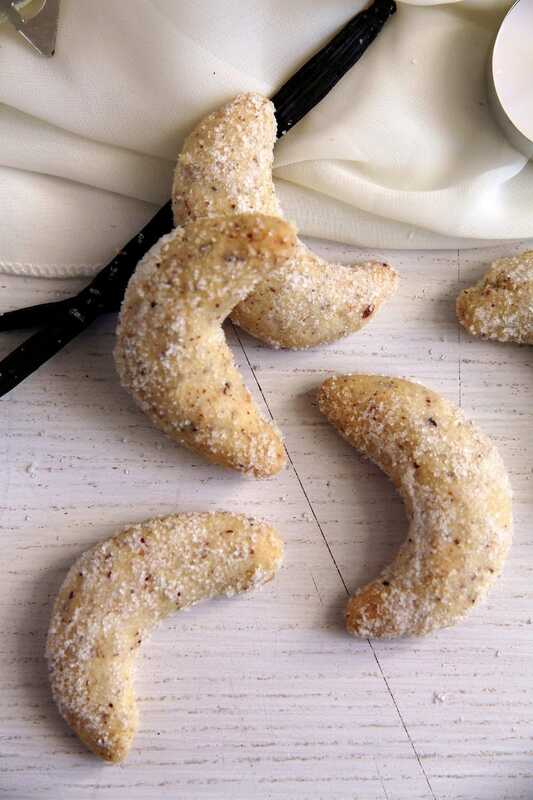 Form the dough pieces into crescents and place them on the baking tray. Don't make the ends too thin, you don't want them to get too brown in the oven. When a tray is full, bake the first batch, in the middle of the oven, for about 13-15 minutes or until very lightly browned around the edges. 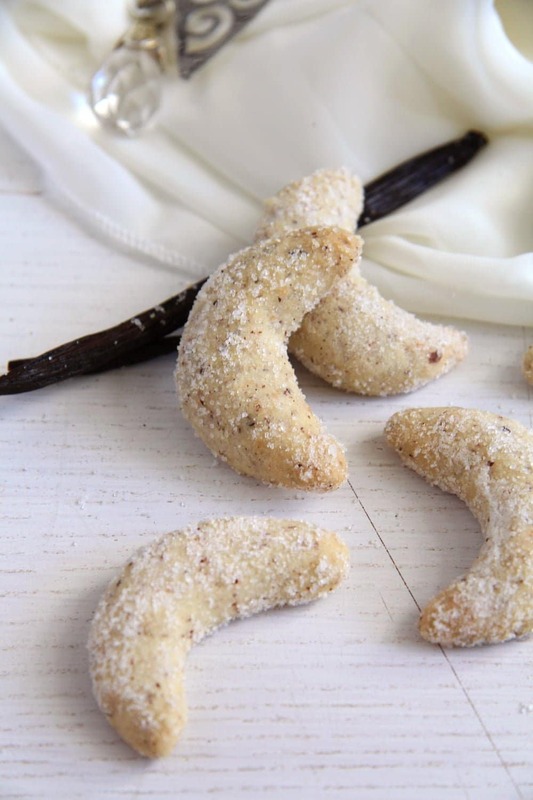 While the first crescents are baking, form the rest. Take the crescents out of the oven and let rest on the tray for 3 or 4 minutes, but not longer. Mix the sugar and the vanilla sugar on a large plate. 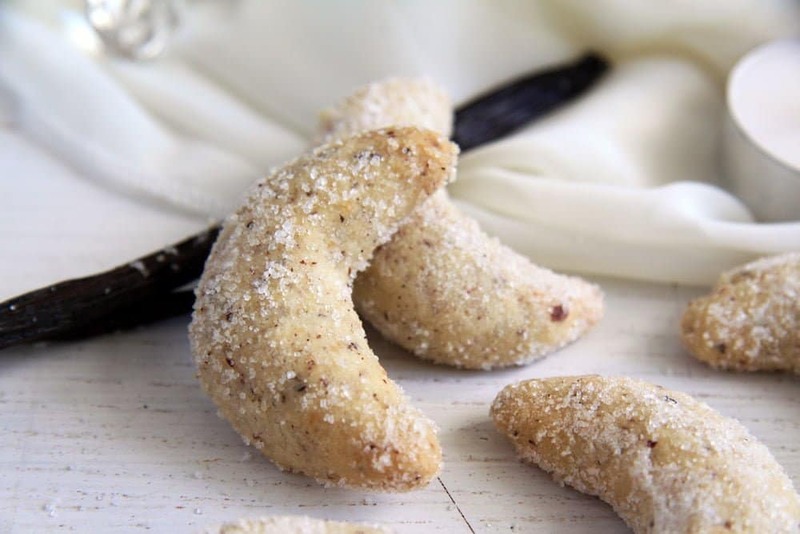 Very carefully roll the crescents into the sugar, then place them on a wire rack to cool completely. You will probably break the first 2 or 3, until you get the hang of it. Don't worry about it, just pop them in your mouth and continue. Repeat the process with the remaining dough. They keep airtight in cookie jars or cookie tins for 2 or 3 weeks. 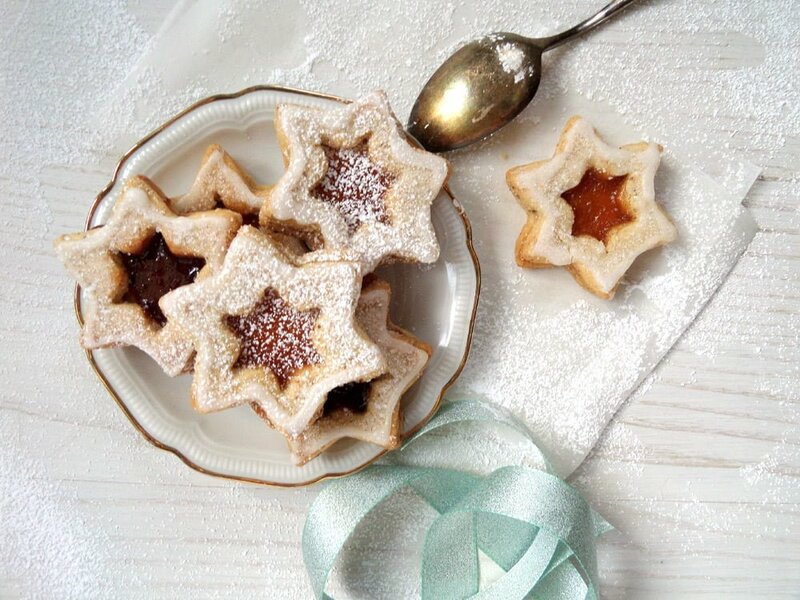 These Austrian cookies are not only super cute but look super delish. Happy Holidays to you! These cookies look really cute. Plus the hazelnuts are an added advantage! I’m so sorry to hear the passing of Oma Lena. It’s always difficult losing someone during the holiday season. What a great recipe that has stood the tes of time. And thanks for sharing your tip on vanilla sugar! Sorry for ypur loss. Almost a year. I just read thus. When storing the kipferl in tins..in fridge or pantry? Thank you. Thank you, Mary Ellen, that is very nice of you to say. You can store the Kipferl in an airtight cookie box at room temperature or in the pantry. They keep well, we are still eating some I baked two weeks ago.